Hey guys and welcome to another post. 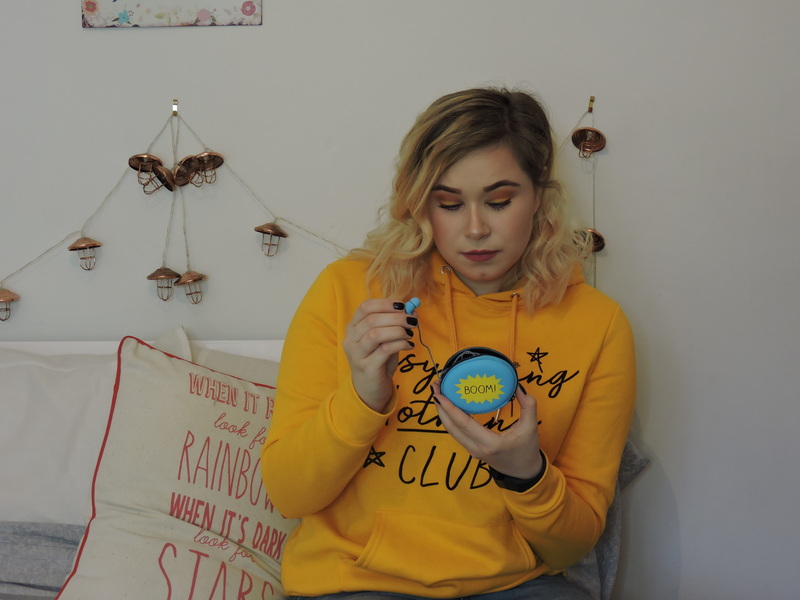 I am so excited for this post, I have been using these products for a while now and I can’t wait to share my opinions on them with you. So Happy Jackson kindly sent me* their new 2018 range and you can buy them from venomcomms and John Lewis . They sent me a variety of some of their new launches and they are so great, I especially love the packaging. I love Happy Jackson products, I love buying mine from boots, I especially love their tropical vanilla moisturising body mist. 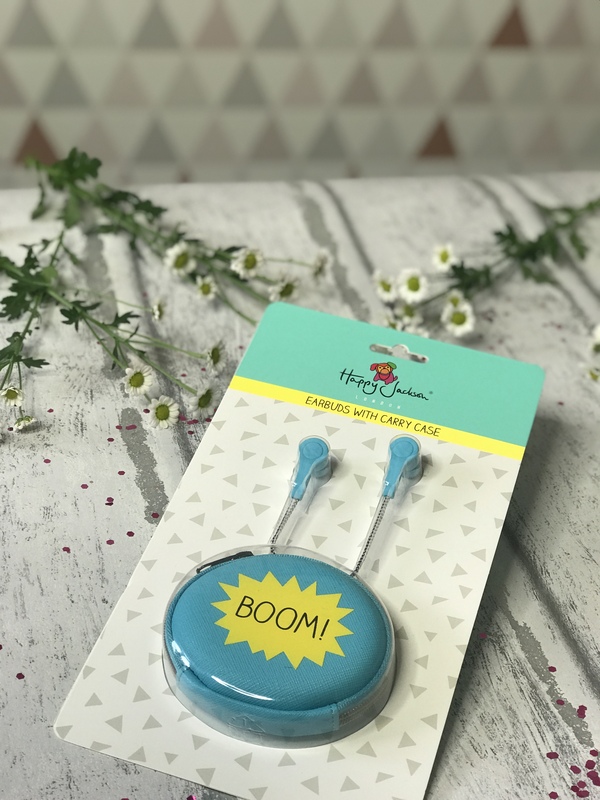 ‘BOOM’ Headphone with a carry case. I absolutely love the packaging of Happy Jackson products and also the outside packaging for the products. I think they nail it every single time and they are always so eye catching. I love it! I love the packaging of the ear buds, I think it is super cute and such a nice bright vibrant blue colour. You know for sure that these won’t be lost in your bag. I think the fact that it comes with a carry case is very HELPFUL and USEFUL because I am always losing headphones in general and when they are in my bag, by having them in a case is the bestsellers thing ever. Also, they won’t get dirty in the case which makes me very happy. They are very very good headphones. They have a little sucker on each end, which is meant to mean that it stays in your ears for longer and it does. These headphones are for all iPhone except iPhone 7 or 8. I use these for my laptop because the headphone jack is a circle, and it fits my laptop perfectly. £14.95. I do think this is a little pricey for what it is. at the end of the day it is a memory stick, you can get them so much cheaper and one will probably be a higher GB. I do think it could have been slightly cheaper than this. I love the packaging of this memory stick. 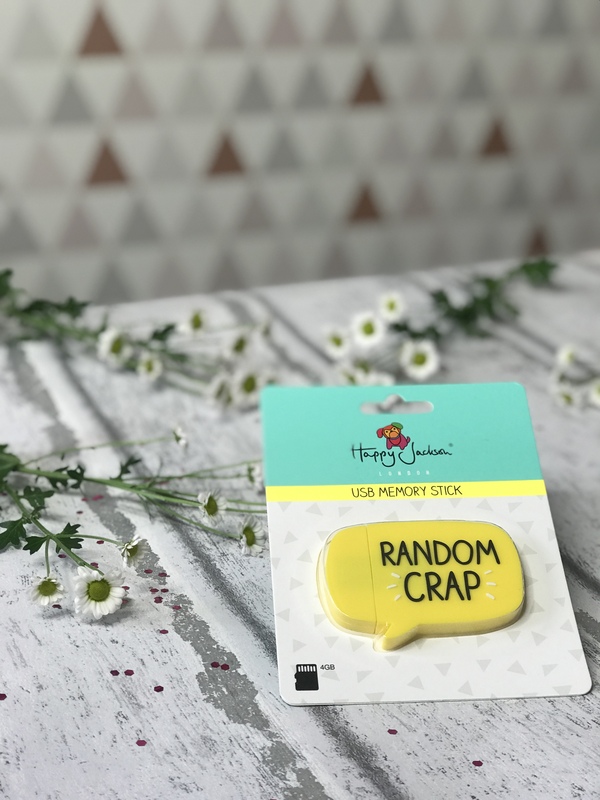 I think it is such a different style of memory stick to have. Normally the ones you see aren’t as creative and eye-catching as this, but this could also be a con as it is a pretty big memory stick. I like the creativity of it and I think it is very eye catching. I like that it is bright yellow as this is such a lovely colour and it stands out a lot, once again you won’t lose it. I like that the packaging is silicon, there is something about silicon that makes everything better. it feels nice to hold and it seems very durable, like it is going to put up a good fight when in your bag. It performs well, like a normal memory stick. 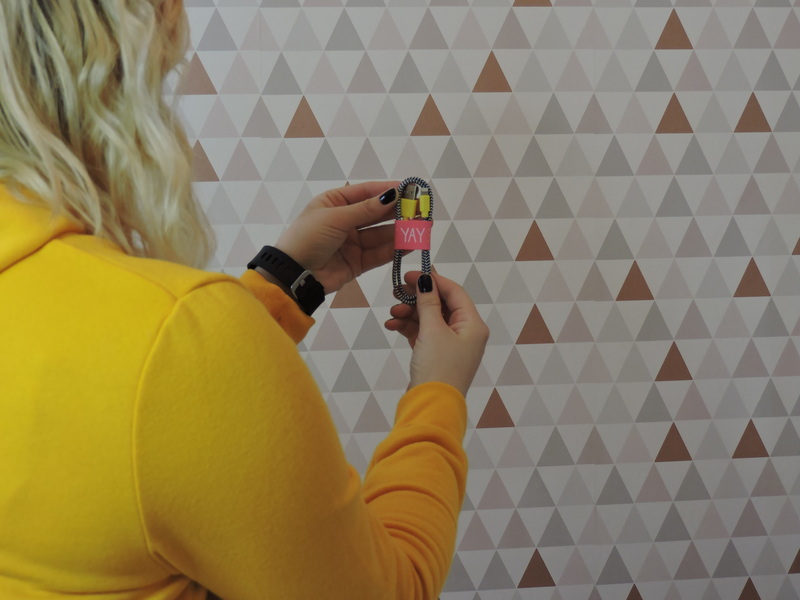 It is very handy as everyone needs a memory stick. On your laptop, if you have your charger whole or another USB insert then when you put this one in, you might not be able to use the other ones as the packaging is really big and it makes it hard to add anything in there. 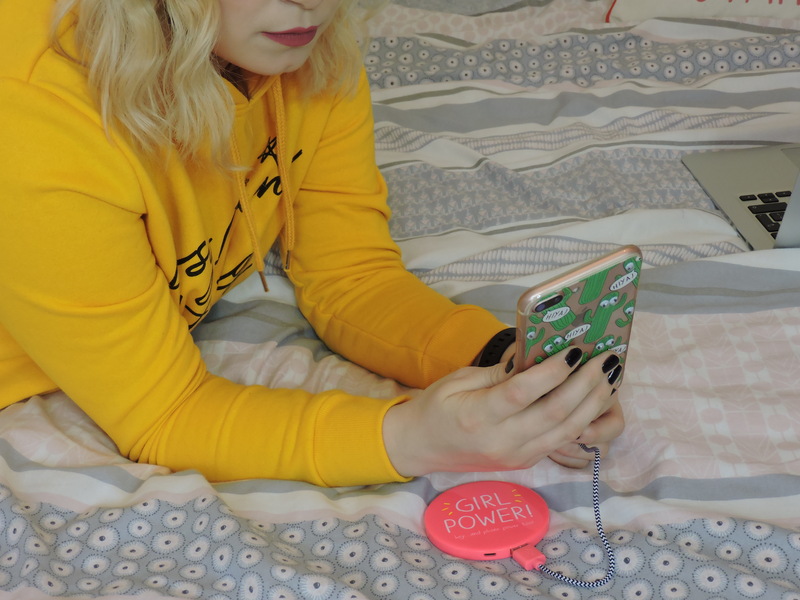 This is definitely the product that I was most excited for because 1) its pink, 2) I was in need of a portable charger and 3) it has a mirror on it. 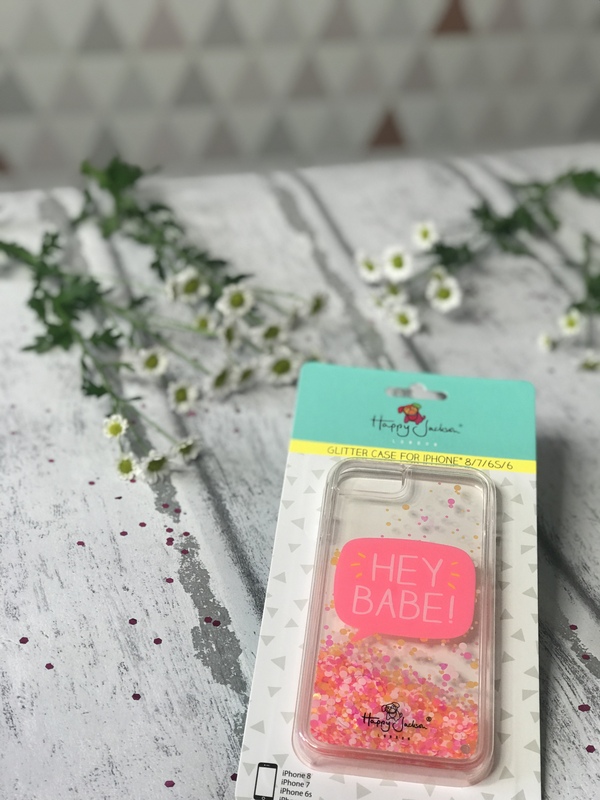 I think the packaging is so cool and different, I love the bright pink! I also really love the font that they use, every time I see this font on a product without seeing the brand name, I always think it is this brand. I think that it is very handy that it has a mirror on it, because lets face it a portable charger is something that you are going to be carrying around with you and a mirror is also something that most people carry around with them two. PUT THE TWO TOGETHER NOW! you get this amazing creation. I do wish that it either came with a sleeve or it was like a little component where you can open it up and look at the mirror inside. This would have been better because I don’t want the mirror to get scratched if it is inside my bag. It does work, however, I notice that it will only charge about 40% until the portable charger dies. I was hoping I would be able to atleast get one full charge, but 40% is still 40% and if you are on 1% then this is going to save your life. This also came with a little cable so you can charge it. £14.95. I think it is pricey for what it is, as it is literally just a cable and you can pick these up for a couple of pounds in your normal store, but I do like the it comes with the little band. The packaging on this is the same as the headphones, it is black and white striped and it is quite long. I like that it comes with a little band to keep the cable together, as you never normally see this, but it is honestly so useful and I will use this for my iPhone cable too. It works like a normal cable. it isn’t as long as the normal apple charger, but it is good if you want to connect your phone to your laptop and don’t want a really long cable. 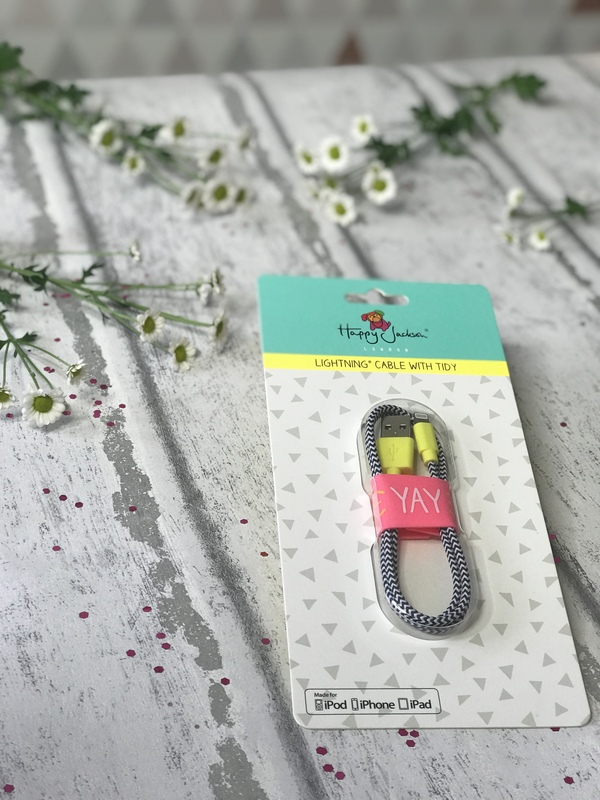 I think the cable is good and nice necessity to have as you always need one of this, it is small enough to keep in your bag nice and tidy with the little YAY band. This case fits the iPhone 8/7/6s and the 6, which makes me so sad as I have the iPhone 7 plus. You can tell that the product is very good quality and very well mad, it is very sturdy. THIS PACKAGING IS SO COOL! I think they have completely got this case right, how could you not want this?! I love it so much! I love the whole look of the case, I think it is so eye-catching and just amazing. I like that the bits inside, float up and down the case! SO COOL! As I haven’t used it on my case, I can’t entirely comment on this but it does feel amazing quality as is very well made. 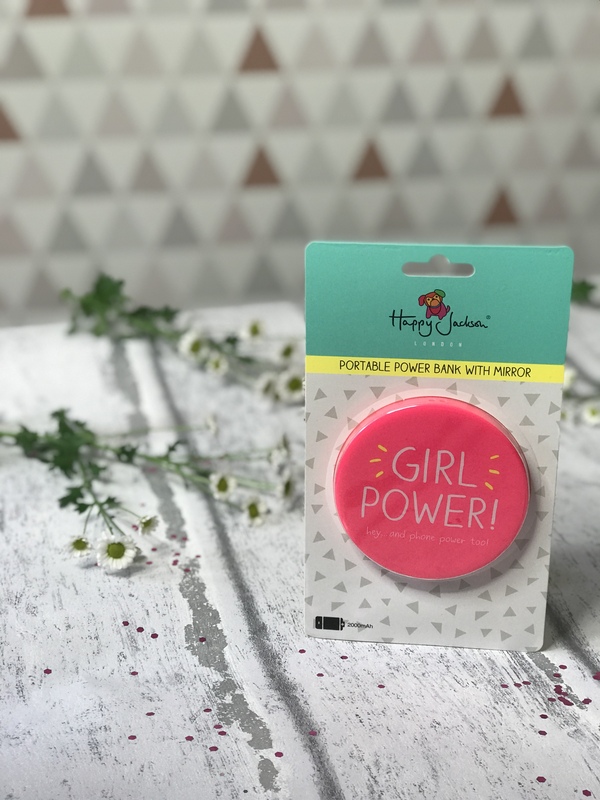 What do you think of these products and have you tried anything from this range yet? I love Happy Jackson products! I think everything they have is so cute and I’ll definitely be checking out some of these new ones!